How do you create a package for a product that used to come in a small baggie? 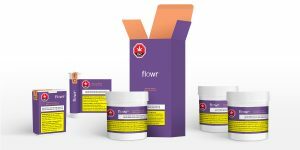 In many geographies, cannabis packaging rules are a real killjoy. In Canada, for example, the package that contains the sealed product requires large, mandatory health messages. Colours are restricted, no images or embossed or shiny textures are allowed. Other markets may have more liberal standards, and where the markets are large enough, it may be worth having different packages for sale in different areas. Five ways to create a distinctive design that allows you to stake out territory in this small space. When designing your logo, give yourself the challenge of your smallest package. Your logo needs to beam off of it and keep beaming while standing six feet away. Put several other brands (in their small packages) beside it: yours should still stand out. How’re you doing? Some packaging legislation only allows a single ownable colour in the design. Choose a strong, distinct colour and own and integrate it as much as you can, using tones and full saturation, from the package and labels, right to the lids. Remember that many purchases will be made online. Decisions will be made on first impressions, by the cover of a single face of your package. Design well for this line-up to make sure your product gets the clicks it deserves. Once purchased and in your customers’ hands, your cannabis product is a tactile experience. How can you make yours more delightful to have and hold? Should you invest in a proprietary vessel? Consider uniqueness in size, shape, and material. What does it look like? How do does it feel? Can it stand on its own? With market growth and future new legislation, the business of edibles and beverages will soon be flourishing. Many geographies will require these products to be absolutely child-proof. Companies will need to invest in unique, stylish packaging that locks kids out, but not so robust that it fools and frustrates adults. First movers on great solutions will have a brand advantage.